The DigitalOut widget controls the digital output ports on a microcontroller, turning them on or off. These ports are typically used to control LEDS, relays (to control high power devices such as 110 volt lights) or motors. The DigitalOut widget turns the digital output port on within a defined range of inputSource values, as set by the from and to settings. So for example, if an AnalogIn was monitoring a knob (potentiometer) used to sense how far a door was open, and the “open” position ranged from 500-700, the DigitalOut could turn on an LED in that position by setting its from to 500 and the to setting to 700. OUT: Shows the output value visually, either on or off. Also shows the type of controller, and the digital output port on the controller. You can click on the circle icon to manually to turn the power on or off. 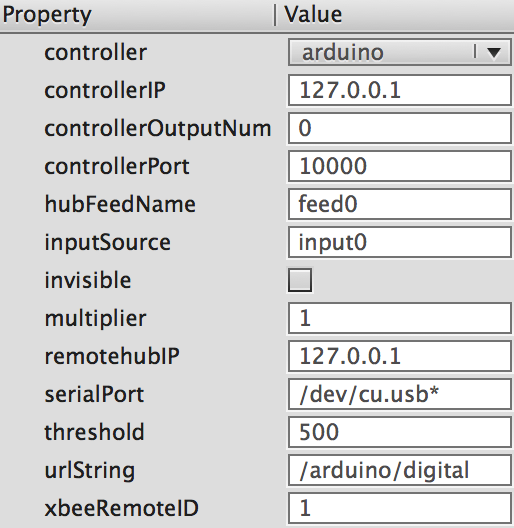 controller – Determines which kind of device the widget communicates with: Arduino, iotnREST, OSC, hubFeed or serial. Use serial (tutorial) to send output to any device that can receive serial input. controllerOutputNum – Sets the output port on the controller – starts at 0 to use the first port on the controller. hubFeedName – The name of the Hub feed to send to. See also the AnalogOut for sending a hub feed, and the HubFeed tutorial. inputSource – The instance name of the source the widget listens to, e.g AnalogIn. threshold: If the input value is equal to or greater than this number (500 by default) then the widget will turn on the output port on the microcontroller. The sendOutput function allows code to send out arbitrary values to any port on the microcontroller.